Sorry, The Challenge has ended. Thanks to the thousands of students across the country who entered! In celebration of Financial Literacy Month, Ramsey Solutions invited high school students to test their personal finance knowledge by taking the $20,000 Financial Literacy Challenge. A Special Thanks to Our Generous Sponsor! Amridge University, a long-time leader in online education, is a private nonprofit distance learning university offering undergraduate, graduate and doctoral programs online to the working adult. To learn more, visit AmridgeUniversity.edu! And congratulations to Alabama Connections Academy, Danville Community High School, and Edwardsburg High School for each winning a subscription to our Foundations in Personal Finance: High School Edition and Foundations in Entrepreneurship curricula! Who Is Eligible: You must be a legal resident of one of the 50 United States or the District of Columbia, and at least 13 years of age. You must also be enrolled and in good academic standing with a public or private high school or equivalent accredited homeschool program. You must be classified as a freshman, sophomore, junior or graduating senior. United States and Tennessee laws will govern this giveaway and contest. NO PURCHASE NECESSARY. Product purchases or other interactions with The Lampo Group LLC (“Lampo”) or Amridge University will not increase your chances of winning. VOID WHERE PROHIBITED BY LAW. See more details below regarding eligibility restrictions. Who Is Not Eligible: Executives, owners, and employees of Lampo or of radio stations carrying The Dave Ramsey Show®; ELP’s or other vendors of Lampo; any executive or employee of Lampo or Amridge University; persons working on this giveaway at any level in any capacity or working for any outside companies or agencies involved in this giveaway or contest, or if any of your immediate family members fall into any of these categories, you are not eligible. Immediate family is defined as spouse, children, and parents. The Challenge must be actually completed and submitted during the Entry Period for the entrant to be qualified to win. Limit one entry per person. Students must achieve a score of 100% on The Challenge to be entered into the drawing for any prize. Entry Period: Entries will be accepted from April 6, 2018 (12:00 a.m. CDT), through April 25, 2018 (11:59 p.m. CDT) ("Entry Period"). The Scholarship: One winner will receive a $10,000.00 scholarship. In addition to all other criteria herein, to qualify to enter the scholarship drawing, students must be classified as a high school senior graduating in 2018. The scholarship must be paid directly to a bona fide educational institution on behalf of the winner. The scholarship is exclusively payable to a bona fide educational institution for educational expenses only. A bona fide educational institution is an accredited post-high school, public or private college, university or technical school. The scholarship must be used or otherwise credited to the winner's student account at the bona fide educational institution during the 2018–2019 academic year or be forfeited. College expenses are defined as tuition, fees, room and board, books, school supplies, or other expenses required by the educational institution for attendance and participation in the student's academic program. In addition to all other requirements of these Rules, scholarship winners must show proof of acceptance to and enrollment in the educational institution for the 2018-2019 academic year prior to payment of the scholarship. $500.00 Amazon.com Gift Cards: All eligible entrants (excluding high school seniors) who are classified as high school freshmen, sophomores, or juniors will be entered in the drawing for one of two $500.00 Amazon.com gift cards (retail value of $500.00 ea.). High school seniors are not eligible to win the Amazon.com gift card. In the event the prizes are unavailable, Lampo reserves the right to substitute another prize of equivalent value for the Amazon.com gift card. Neither Lampo or Amridge University is affiliated with Amazon.com or any of its parents or subsidiaries. The offering of this prize is not an endorsement by or of any product or service offered by Amazon.com, and likewise Amazon.com is in no way involved in this giveaway. Scholarship: Only graduating high school seniors will be eligible for the scholarship. Underclassmen and seniors not graduating in 2018 will not be eligible to win. Eligible entrants having scored a 100% in The Challenge will be entered for a random computer drawing. The first eligible entrant drawn will win the $10,000.00 scholarship. Odds of winning will depend upon the number of eligible entries. If prizes are forfeited or winners do not claim prizes, Lampo may, but is not required to, draw alternate winners. $500.00 Amazon.com Gift Cards: All underclassmen scoring 100% on The Challenge will be entered to win one of two $500.00 Amazon.com gift cards. Winners of the Amazon.com gift cards shall be selected by Lampo via a random, computer-generated drawing. The first two entries drawn will each win an Amazon.com gift card. Odds of winning will depend upon the number of eligible entries. If prizes are forfeited or winners do not claim prizes, Lampo may, but is not required to, draw alternate winners. Curriculum: The current high schools attended by the winners of the one $10,000.00 scholarship and the two $500 Amazon.com gift cards will receive a one-year subscription to FoundationsDigital, which provides access to our Foundations in Personal Finance and Foundations in Entrepreneurship curriculum for schools. Drawing: The winners will be drawn as soon as practicable after the close of the entry period, estimated to be April 27, 2018. Winner's Obligations: The prize winners are required to execute an affidavit of eligibility as well as a sponsors' liability release. Winner shall also be required to show proof of enrollment and academic good standing at the student's current school. Winners under the age of 18 must also provide written parental consent and release before receipt, payment and/or distribution of any winning. Noncompliance within these obligations may result in disqualification and selection of an alternate winner. Return of any prize or prize notification as undeliverable may result in disqualification and selection of an alternate winner. Unless prohibited by law, the winner grants to The Lampo Group, LLC the right to use and publish their names and appropriate images in print, and in any other media in connection with this giveaway, for advertising and promotional purposes (not as an endorsement of any product or service) without additional compensation. The winner must sign and return an appropriate IRS form, if applicable, before receiving a prize. Winners must satisfy all obligations within seven (7) business days of notice of winning. Incomplete or Multiple Entries: One entry per person. Multiple automated entries, entries submitted by others on your behalf, or entries submitted by you using different identities or addresses will be considered fraudulent, rendering you ineligible for any prize on any day. Incomplete entries will not be eligible to win. Cumulative Prizes: The total value of all prizes, inclusive of the scholarship, gift cards, and curriculum awarded during this giveaway will be approximately $21,500.00. The scholarship is valued at $10,000.00. The Amazon.com gift cards have a retail value of $500.00 each. The curriculum prizes are valued at $3,500.00 each. Entries Not Received: No sponsor shall be responsible for lost, late, or misdirected entries or for any computer, online, telephone, or technical malfunctions that may occur. All entries become the property of Lampo and will not be returned. Odds of winning a prize will depend on the number of eligible entries received. Neither product purchases nor email or mobile opt-ins will increase an individual's chances of winning. Taxes: All taxes on prizes are the responsibility of the prize winners. Winners must sign required IRS forms before receiving any prize. Pursuant to IRS Circular 230, these Rules nor any other communication regarding this giveaway is for the purpose of helping you avoid any penalties that may be imposed by federal tax law, and no affected taxpayer may use this giveaway or its rules in that manner. Entrant's Agreement: By entering, you agree to abide by the terms of these official rules and by the decisions we make regarding this giveaway, which are final and binding on all matters. If you do not agree to that, please do not enter. Announcing Winners: Winners will be announced on or before May 31, 2018, and will be notified of their winnings via a telephone call to the winner's school. Winners not contacted by phone at the time of their selection will be notified by email and/or by a later telephone call. Signing Documents: If you win, you will be required to sign an affidavit of eligibility and a release before you receive your prize. If you decide you would rather not sign the release which we submit to you, you will not receive your prize. under no circumstances will entrant be permitted to obtain awards for, and entry hereby waives all rights to claim punitive, incidental and consequential damages and any other damages, other than out-of-pocket expenses, and any and all rights to have damages increased or multiplied. SOME JURISDICTIONS PROHIBIT EXLCUSION OF LIABILTIY FOR INCIDENTIAL OR CONSEQUENTIAL DAMAGES, SO PORTIONS OF THE ABOVE MAY NOT APPLY TO YOU. All issues or questions concerning validity, construction, interpretation or enforceability of these rules, entrant's rights or obligations, or the rights or obligations of the sponsor, shall be governed by, and construed in accordance with the laws of the State of Tennessee, without regard to any choice of law rules. Termination of Giveaway: We reserve the right, at our sole discretion, to disqualify anyone who tampers with the entry process, and to cancel, terminate, modify, or suspend the sweepstakes if anything required for its conduct should malfunction or be deemed illegal. Should this sweepstakes be terminated prior to the end of any entry period, which we may do at our sole discretion, a notice will be posted on www.ramseyeducation.com/challenge. Jurisdiction and Venue: Tennessee law applies to this giveaway. Void where prohibited for any reason. All disputes resulting in legal action shall be resolved in the courts of Williamson County, Tennessee, and Entrant consents to the exclusive jurisdiction of those courts. Should sponsors find it necessary to seek legal assistance to enforce their rights, their damages, if any, shall include its reasonable legal expenses and fees. Internet and Mobile: Sponsors reserve the right, at our sole discretion, to disqualify anyone who tampers with the entry process, and to cancel, terminate, modify, or suspend the giveaway if anything required for its conduct should malfunction or be deemed illegal. Disclaimer: Sponsors assume no responsibility for anything that happens outside of our control to delay or prevent your entry, and we assume no responsibility for anything within our control that delays or prevents your entry except where by the exercise of ordinary care we could have kept it from happening or promptly corrected it. Sponsors assume no liability whatsoever related to the prize, including any tax or other issues associated with acceptance, use of the prize, or contracting with the prize provider. Sponsors are not responsible for any tax implications of the acceptance of any prize and makes no representation regarding the tax implications of accepting the prize or using any service of prize provider. Winners' List: For a list of winners, send a self-addressed, stamped envelope to The Lampo Group, LLC, 1749 Mallory Lane, Brentwood, Tennessee 37027, Attn. Teacher Appreciation Giveaway, Education Solutions Department. Requests received later than six months following the last drawing date will not be filled. The Sponsor: This giveaway is cosponsored by us, The Lampo Group, LLC, 1749 Mallory Lane, Brentwood, Tennessee 37027, and Amridge University, 1200 Taylor Road, Montgomery, Alabama 36117. Teachers, we want to help you make the difference you've dreamed of. 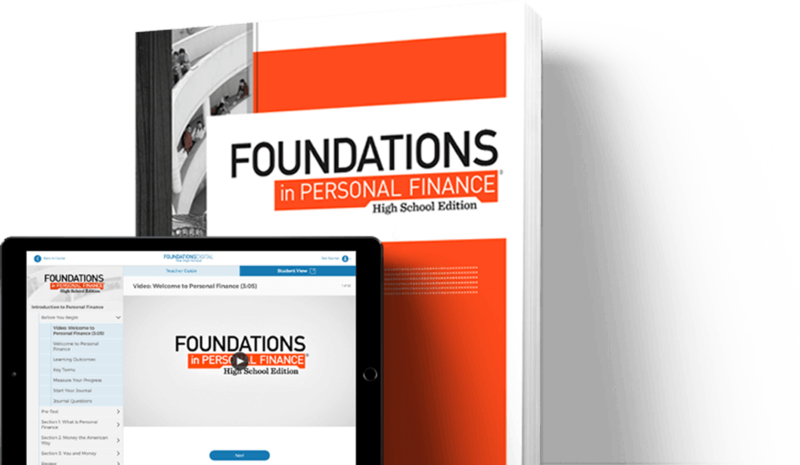 Our life-changing Foundations in Personal Finance: High School Edition curriculum equips you with everything you need to change the way your students look at money and life. Your students will grow in confidence as you teach them to save, spend wisely, avoid debt, budget with intention, and build wealth so they can live generously. This curriculum has been taught in more than 40% of high schools across the country, impacting over 4 million students' lives!